2 bed, 2 bath 2 story 1500 square foot home on a unique 16 acre parcel just 5 minutes north of Willits. A year-round creek runs through the forest, a nearby water windmill tower stands adjacent to a large meadow with structures that frame the drive-in, a large barn, picturesque cottage, a metal roofed garage beautifully overgrown in ivy, and newer wood shed. 20X30 green house, nearby water tank, and a well with a 2nd tank located higher up on the property. 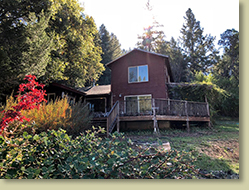 As a Ukiah real estate and Mendocino County real estate broker, The Landlady, I have had the joy of helping individuals, couples, and families find their Ukiah home and Mendocino County country property for over 35 years. Driving across the United States over 40 years ago in search of a place to raise my family, I knew I was home when I met the people and saw the land of Mendocino County. I am so grateful to live here and be a part of the Ukiah community. Over the years, I walked the mountains and valleys with buyers and sellers gaining an extensive knowledge of Ukiah and Mendocino County real estate, and the history and possibilities of the land. I owned and managed my own real estate company with offices in Ukiah and Willits for 10 years and I am Eco-Green Certified. You are the focus of this long real estate experience as we read a property together. We look for the possibilities in the land or home and what can be done to smoothly and efficiently resolve anything that may come up in the selling and buying process. You will have at your disposal an extensive network of Ukiah trade and Mendocino County professionals who know the Landlady and are ready with their expertise to resolve whatever comes up. Click here for a free custom list of properties sent regularly to you, check out my current listings for Ukiah real estate or Mendocino County real estate properties, or click here to do your own property search. I am happy to be in a profession that is of service to my community and enables me to continue hiking the mountains I love and walking through the woods of Mendocino County. After all, it's why I am known in Ukiah real estate as The Landlady. You want to work with Cindy. She knows Mendocino County real estate, from who owned the land 20 years ago to whom you want to hire to drill your well. She's friends with everybody, and she knows a fair deal. After her wise questions and a few well-chosen exploratory site visits, we found the thrilling property that had everything we wanted. She made efficient use of our time, and she's great company to boot. You will trust her. T.B.